A jungle gym? A shopping cart? Tree branches? A countertop? Kids will find a way to climb on them! I’ve watched my nephew Graham climb on all of these things, plus those blue postal drop boxes, the Bay Area’s iconic eucalyptus trees, and poles of any kind—the ultimate slippery challenge. He likes to practice climbing on his bunkbeds while avoiding the ladder, bridging the wide gap between the top and bottom bunks with a giant, awkward step. I remember thinking once while I watched him, I’ve got almost a two-foot advantage, but I’m not sure I’d be able to maneuver my way up there. That thought seems to shine a light on the difference between Graham and me: in his mind, there’s no chance that he won’t make it up there. There’s nothing else that could possibly tempt him away from the present challenge of pushing and reaching and pulling, failing and triumphing bit by bit, until he can get to that corner of the world where he has never been before. If you have a child overflowing with spirit and energy, you’re probably also feeling the challenge of nurturing their thirst for adventure while ensuring that it unfolds in a healthy environment. 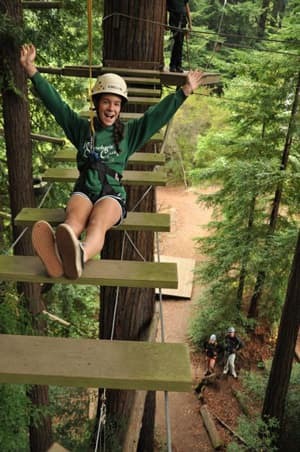 Last summer, Graham got to try out his enthusiasm for risk and adventure at summer camp, an environment in the Santa Cruz Mountains designed as that perfect middle ground for carefully approaching the extreme challenges he can’t get enough of. I can imagine his face when he first looked up at the 36-foot-high rock wall, feeling the mysterious and absolute certainty that he would reach the very top and make everyone below proud. Not only that—he got to climb up into the redwoods (definitely taller than any other trees he has taken on), traverse rope bridges, and leap from platforms into midair. 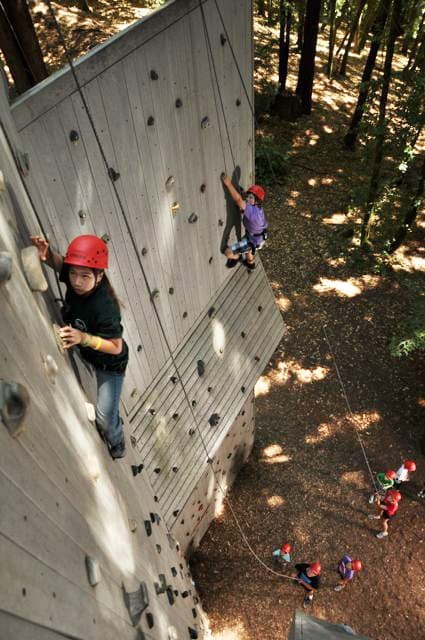 The first thing the kids learn about is how to make smart choices, and they are always wearing climbing helmets, are secured in harnesses, and are connected to a belay system throughout their climbing and ropes course adventures. before, but he has become an observer as well as a climber—a true explorer. He seems to approach his quests with more purpose: taking a step back to look at the whole, walking around his various micro-mountains first to assess whether there’s a better path to the top that he hasn’t yet thought of. When he hits a snag now, I see him pause to re-evaluate, sometimes even climbing back to the start to try again a different way. Camp didn’t temper Graham’s belief that he can do anything he sets his mind to. I think this belief was expanded even more by the things he was able to do in this wide-open camp adventure—what they let him do and things he couldn’t even imagine before going to camp. As soon as Graham came back from his first trip to camp, he was already talking about next summer. His little brother will be old enough to register this year too, and Graham has already taught him the songs the campers all sing and how to follow a chore wheel to help keep your cabin clean and cozy. Graham is determined that this year he’ll also learn how to climb on a horse, but he’s actually more fascinated by the fact that he’ll be responsible for taking care of the horse—a brand-new adventure that is still beyond his experience. So, he continues to climb his mountains, more and more of them both literal and figurative, crucial challenges for his evolving sense of identity. Kennolyn’s activities are designed with room for kids to grow and to be amazed by their own accomplishments. Get in touch with us to find out more about our programs for kids with all kinds of interests and strengths.